Incenses may be used as part of a magic ritual or simply used on its own with visualisation to attract the appropriate magical influences into your life. There are several methods of using incense. The Charcoal Method will produce the strongest scent and lots of smoke. 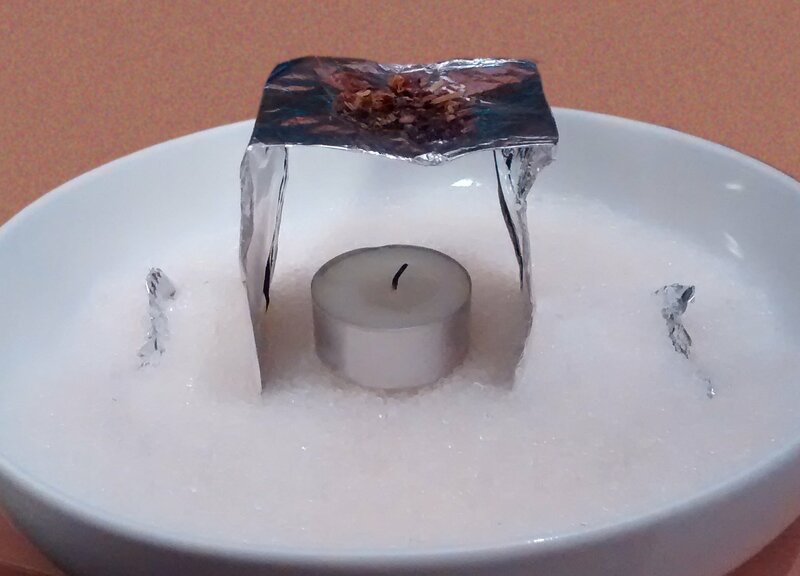 The Oil Burner Method produces a much more gentle fragrance and very little smoke. 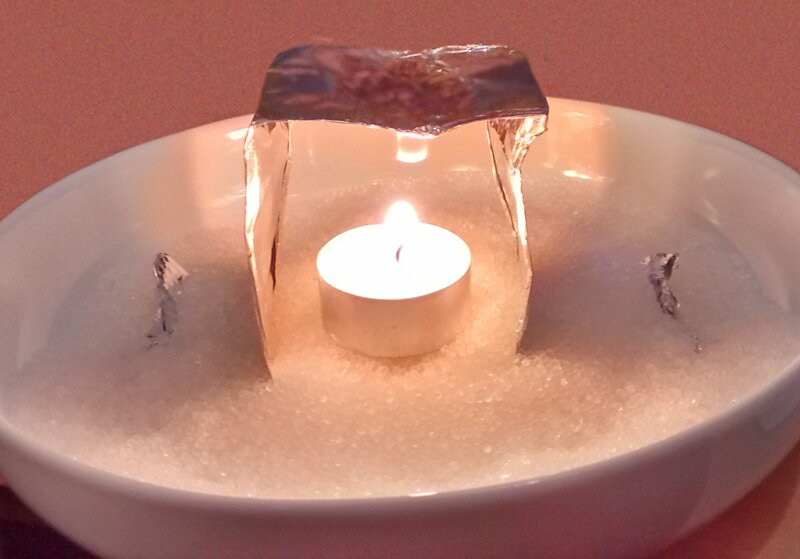 The Oil Burner Method is ideal if you (or someone else) is sensitive to smoke. Or if you find that the Charcoal Method keeps setting off your smoke alarm! Stand your incense burner (or dish) on a heat proof surface. Half fill your burner (or dish) with dry sand, salt or earth. This will help to provide insulation against the heat of the charcoal disc. To light the charcoal disc, hold it with tongs in a naked flame. If you have no tongs, place the disc in the burner and light it from there - not quite so easy and it will take a little longer to light. The charcoal disc will sparkle and smoke slightly and will become very hot very quickly. After a few seconds, the sparks will stop and part of the disc will have begun to glow red hot. Your disc is now lit. Place the disc in the burner on top of the loose earth or sand and sprinkle up to half a teaspoonful of loose incense on top of it. The incense will start to smoulder and release fragrant smoke almost immediately. When the smoke begins to thin out, add a bit more incense - not too much or you will extinguish the charcoal block. Incenses containing high proportions of resins and gums will burn for much longer than those containing mostly leaves, woods and flower petals. When you have finished your incense burning, wait until the disc has cooled completely before disposing of it. This produces a much more gentle fragrance and very little smoke. This is ideal if you (or someone else) is sensitive to smoke. Or if you have an over-sensitive smoke alarm. Pour a little oil into the bowl at the top of the burner (about 1cm depth is ideal). You can use any aromatherapy carrier oil or a good quality cooking oil. Don't use an oil that has had a fragrance or flavouring added to it. (i.e. Not a blended massage oil that has essential oils added to it. That lovely garlic/chilli/herb infused cooking oils are wonderful for cooking with but not suitable for incense burning! Use a pure unblended, unfragranced, unflavoured oil. Ideal oils are: olive, almond, coconut, grapeseed, avocado, jojoba, sunflower etc. Our personal favourite is olive oil. Add about 1/4 teaspoon of incense to the bowl. Place a lighted tea-light underneath the bowl. The fragrance of the incense will soon start to fill the room. AlwaysÂ place the oil burner on a heatproof mat. Never leave the lighted candle unattended and keep away from curtains etc. Keep out of reach of children and pets. Do not let all of the oil evaporate from the bowl or it may crack. Do not overfill the bowl. Keep a damp cloth nearby in case you need to extinguish the flame. The oil/incense mixture in the bowl of the burner will remain hot long after you extinguish the candle flame so wait at least an hour before touching the burner to clean it. It's very cheap, it looks cheap and it is a bit flimsy - so extra caution while burning incense using this method!. Also, make sure you will not be disturbed from the moment you start setting up to when you clear it all away. If anyone unfamiliar with burning loose incense see this, they are likely to assume that you are involved with something illegal and/or dangerous..
On the plus side. It costs pennies and you've probably got everything you need already - if not you can get it from your local grocery store. And it works! a shallow fireproof bowl or dish at least 4 inches (10cm) wide. sand, earth or salt - enough to fill the bowl to at least 1 inch (2.5cm) deep. 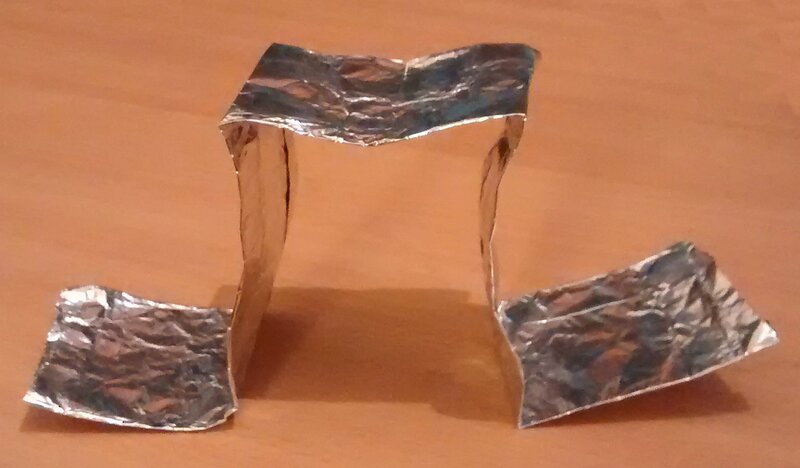 Fold the piece of aluminium foil in half. Fold in half two more times in the same direction as the first fold. 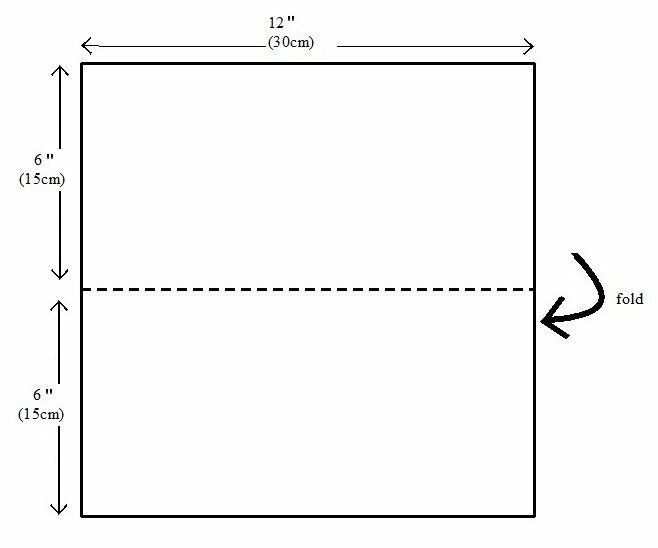 Make a fold 1/2 inch (12mm) from one of the long edges. Do the same for the other edge. 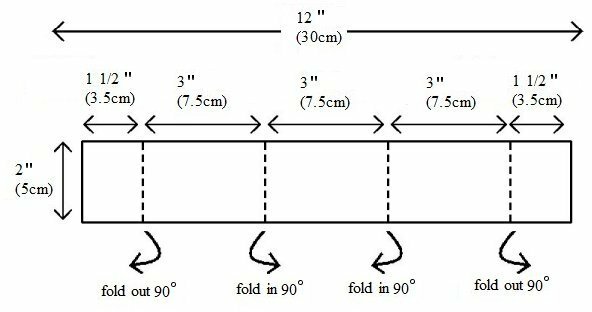 Now make 90 degree folds as shown in the diagram below. It should look a bit like a little table (with very large feet). If it doesn't stand up on it's own or if the top of the foil incense burner isn't horizontal, make any small adjustments until it does. Stand your foil table in the dish. Add the sand (or earth or salt) to completely cover the feet of the incense burner and hold it securely. Check that it is secure and isn't going to fall over. Place a quarter to half a teaspoonful of incense onto the top of your burner. Place a tealight candle under the burner and light the candle. Never leave this unattended and Keep a damp cloth nearby in case you need to cover the dish and smother the flames if neccessary. When you've finished, gently blow out the candle. Wait at least half an hour until everything has cooled down and then dispose of the foil burner. This is absolutely essential for the success of any spell. Visualise your goal. Think about your visualisation before you begin. Always visualise yourself as having already achieved your goal. For example - If you're looking for love, see yourself as being in a loving relationship. If you need money, see yourself as already having that much needed money to buy those things you need. See Â£50 notes raining down all around you. If you need healing or wish to be healthier, visualise yourself as fully healed (not as sick and wanting to be better). See yourself as you want to be not as you don't want to be. Make your visualisation as strong as possible. Don't just wish or hope otherwise wishing or hoping is all you will achieve. It doesn't matter if you can't actually "see" when visualising. So long as you can imagine what it feels like to have achieved your goal. Never do magick to annoy, hurt, kill, manipulate or control another person or for revenge. Don't use magick to try to win the love of a specific person. Forcing someone to love you against their will is to control and manipulate them. You may well find that you are quite incompatible with this person. If you want a loving relationship, use magick to attract your ideal mate and trust the magick to choose the right person for you. Donâ€™t use magick to impress other people or to simply boost your ego. Find another way to achieve what you need without causing harm to anyone If you use magick for evil purposes, evil will return to you three times over in this lifetime. (Some people say ten times). It's not worth it! This happens regardless of whether your spell works or not. And if you think you can protect yourself from receiving all that bad luck and evil returning to you, you can't. I've met far too many people who convinced themselves that they were clever enough to protect themselves from the rebound effect of their negative magick. They all have one thing in common - They attract bad luck like a magnet. Their lives are a complete mess and they are desperately unhappy.